Almost, anyway. If you have not heard, I’ve moved to Aberdeen, SD. I’m getting the new space ready to start creating. I think I’m going to need some shelves. In the mean time, if you are interested in what I’ve been up to in a non-Stained Woods kind of way, you can check out my new tumblr. HubCitizen.tumblr.com I’m trying to keep track of all the new things, sayings, photos that I run into while getting settled in to the other side of the Mid-West. Check it out, send a comment or inspiration my way. Yes, it’s true. I am no longer living in Indiana, and have moved to Aberdeen, South Dakota. I’m still setting up the new work space, and can’t wait to get back to staining wood. Until then, check out my new tumblr. Hub Citizen. I’m attempting to track what I seen and learn about my new home. Stained Woods and I are in the process of moving to South Dakota. Here’s a few pics of my dismantled work spaces. Oh, and I’ve found some new masking materials. Tape with attached plastic sheeting for additional masking. Very useful for painting the ceiling, but not sure if it will be added into the Stained Woods inventory. Yes, the stained glass below is my work, too. 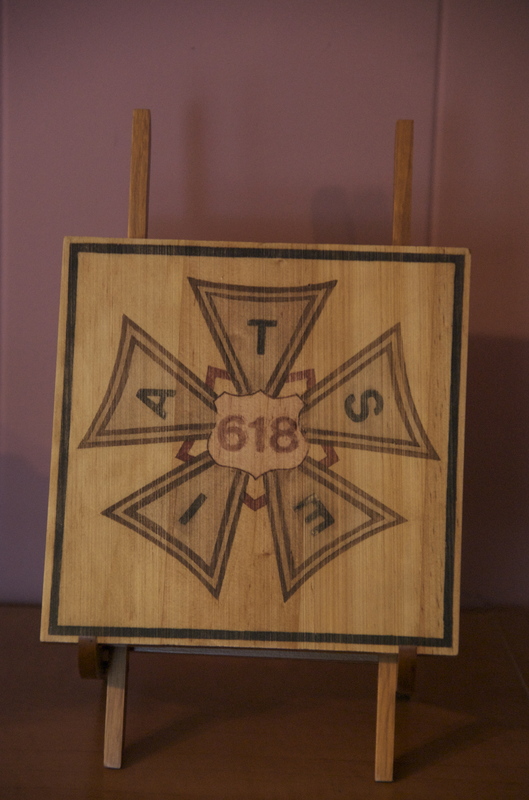 I’ve blogged about my IATSE 618 logo project several times. I am feeling the need to get the final project out of my head, so I can move on to something else. I tried several new techniques, most of which turned out rather well: New stencil paper, arced tape lines, stencil numbers and letters. I’ve learned a few unexpected lessons along the way as well: Don’t over-burnish the tape, ’cause you’ll get dimples; the stencil numbers are rather sticky and the wood needs to be cleaned after use; and most importantly, measure the length of the nails used in the sawtooth picture hanger. I couldn’t fix the last problem, and have been angry at myself for this simple mistake for quite awhile. It’s time to move on. Not that I won’t come back to it, but I think I need to mix it up a bit. I just had to share the new knife I picked up today. The X-Acto Retractable. It’s like a ball point pen, but with a blade! I can’t wait to use it! I finally made it to Hawaii! I’ve wanted to go there (as have so many) for quite some time, and just made it home. One of the visual themes that I kept running into were Hawaiian quilts and tattoos. There’s a lot of history behind both, too. I took a few pics of patterns that I liked, and I might even try. And, yes, before you ask, several are from the shower curtain! I also managed to pick up a bit of lumber while I was there, too. It was in a great little store called Woodshop Gallery & Cafe in Honomu Village near Akaka Falls. Some mango and curly koa. Now to figure out what to do with it.